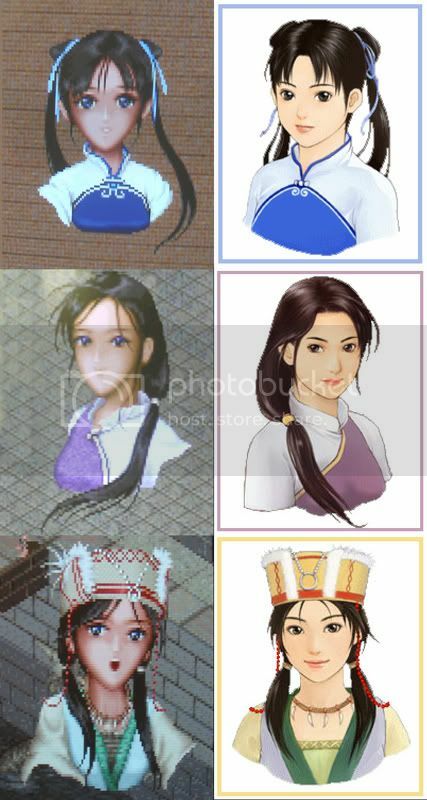 Which Ling Er do you like? I played Xian Jian DOS version, and I thought Ling Er looked a lot cuter than the XP version which is suppose to have better graphics etc.. The 95/98 version. Her 梦蛇 dream snake transformation is immediately usable upon acquiring her in the 锁妖塔 Demon Sealing Tower, thus doubling her attack power for that segment of the game, which I found particularly useful for the gold dragon and the seal god. In the XP version, she is already in her snake form, which I guess would logically make the transformation not usable, but she doesn't have the attack boost in this permanent form, which makes her a lot weaker than Yueru. Her dream snake transformation is a lot more powerful in the 95/98 version, since it's compatible with her dual sword, which saves quite a bit of MP for Xiaoyao, particularly going through the underground maze. The XP version uses one attack regardless of weapon, which makes her 双龙剑 latest dual sword useless. Fortunately, I bought 玉女剑 that female sword in the capital. I also didn't like the changes she underwent after inheriting her mother's items in the XP version. In the 95/98 version, the change is just cosmetic as far as I can tell, possibly with the additional ability to equip her mother's items. In the XP version, her defense and agility ratings both went down drastically, which made her strike slower than quite a few of the enemies in the maze. She lost the ability to equip swords, being only limited to the 青蛇仗 azure snake staff as her weapon. This made her hit a lot harder, but until you cast 醉仙梦月步 the double strike buff, it just made her the equal of the dual wield 95/98 version. wow, I didn't notice.. I thought Ling Er was just more powerful after gaining her mother's items..hmm.. Since I don't have a save before her transformation in the 95 version, I can't tell whether the statistical superiority of the 95 version compared to the pre-transformation XP version is due to the change or simply that she was better in the old version. The mechanics of the two games also differ enough such that these stats may just be cosmetic. What is certain, however, is that the post-transformation Linger in the XP version has really awful agi stat while having a really high offensive stat. [Edit] I should probably say something about characterization before I get stoned out of the forums. The basic plot is the same for both versions, as is most of the dialog, particularly with Linger, who is not on screen a lot of the time. There is, however, a difference in the two versions in the Demon Sealing Tower. In the 95 version, the poem she recites ends with the line "错把牛郎当情郎," which literally translates into "I mistook a cowherd for a lover," but I think an idiomatic translation is more appropriate: "I mistook a boor for my soul mate." I don't remember the particular word in the XP version, but I believe the last line loosely translates into "everything is over." The difference in the poem illustrates a difference in the two versions. The words of the 95 Linger pings the blame on Xiaoyao. She accuses him of being a lowlife, most likely out of the belief that he abandoned her by will, since she didn't know that he lost his memory of their first meeting on the island. The XP Linger is saddened and hurt by Xiaoyao's behavior, but she does not blame anyone. Both, perhaps, can be motivated by either a small hope that she can bring Xiaoyao around, but the XP Linger's words are much less confrontational compared to those of the 95 Linger. The XP Linger's behavior fits much more with A Nu's conception of Nu Wa: "Nu Wa is the earth mother, the most compassionate towards humanity. It does not matter that you do not know the ceremonial form; you need only be sincere. She is never angry." The XP Linger is consistently gentle--more fitting with that which she was taught on the island and what she was later to become--, whereas the 95 Linger exhibited a moment of venom. It is for this that I prefer the XP version, however small the difference is. Are you talking about the character Sprite or the portrait in conversation? 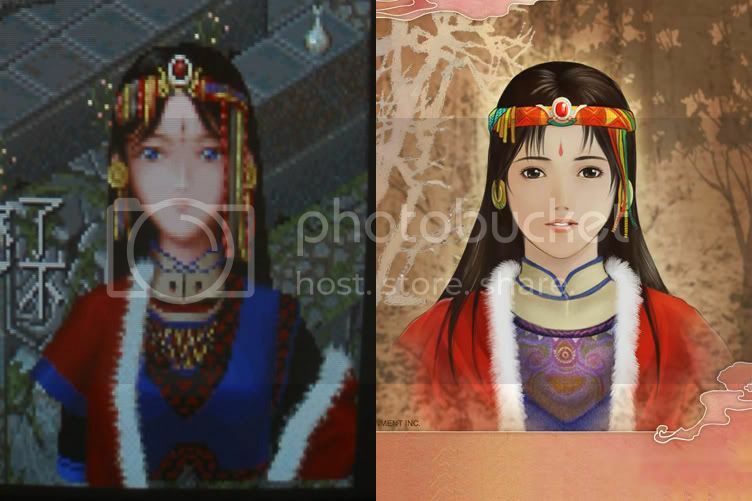 Personally, I don't find any of the beautiful girls' portraitsin the XP version to be stunning like they should be. Though I don't really understand it; like Chibi Jennifer said, the XP version should have better graphics and hence be capable of showing more detail in the characters' portraits, but instead it shows less! I like all the DOS/95 versions' girls' pictures much better! Especially Ling'er's, Linger's mother's, and the White Miao leader's. Why do they make them look so much worse in the newer version?? 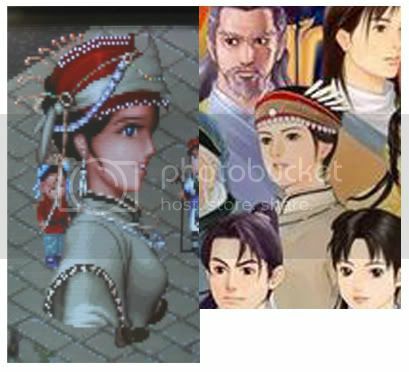 >_< The White Miao Leader in XP is not pretty at all, but in the older version she has feathers in her headdress and has a feminine-looking face (and is really beautiful). The XP Linger's mum has a MUCH simpler outfit than the DOS one. From what i can see.. their faces were all a lot pointier in the DOS version, and made slightly more chubby in XP. edit: Ok Yueru's face is the pointiest but I meant that Linger's face goes from a wider forehead to a pointy chin more sharply. Re: Which Ling Er do you like?